This kids Sith robe is a licensed Star Wars accessory. The 100% polyester robe has a smooth, comfortable interior and a lightly textured, realistic exterior. An over-sized hood and large sleeves add to the authenticity of this detailed Sith robe. 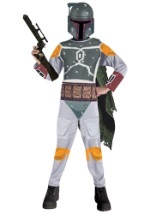 Let your child battle the Jedi on Halloween in this kids Sith robe.